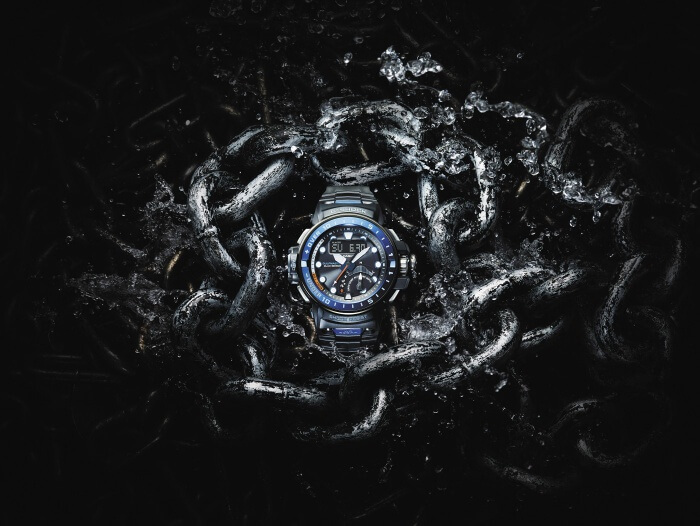 The most surprising Casio news out of Baselworld 2016 is the announcement of the G-Shock Gulfmaster GWN-Q1000, an all-new ocean concept Gulfmaster model and the first G-Shock to feature the Quad Sensor. The Quad Sensor includes the altimeter-barometer, compass (with automatic horizontal compensation), and thermometer of the Triple Sensor Version 3, plus a depth gauge to measure water depth like the upcoming Frogman GWF-D1000. The GWN-Q1000 is a significant upgrade to the Gulfmaster GWN-1000 that will prove its seaworthiness to the most demanding maritime users. Update: The first two GWN-Q1000 models are the black and blue GWN-Q1000-1AJF and the white and blue GWN-Q1000-7AJF with a list price of ¥100,000 JPY each and an August 2016 release in Japan. 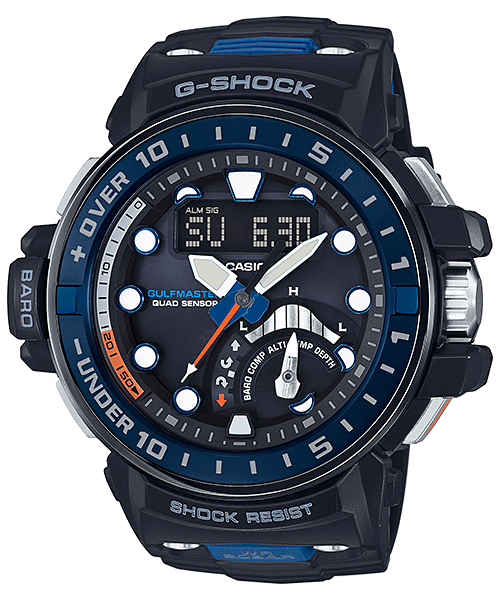 Update 2: Casio announced a September 2016 Asia release for the GWN-Q1000-1A and GWN-Q1000-7A. Casio America announced the GWNQ1000-1A for a September release with a list price of $850. The environmental sensors are designed to track changing ocean conditions by coast guard personnel and others who are active on the sea. The barometer tracks changes in atmospheric pressure to predict sudden weather changes. The thermometer tracks changes in air and water temperature. The compass helps to determine the direction of the wind and tides. The depth meter measures the current depth when underwater. The GWN-Q1000 also has a tide graph and moon age data. 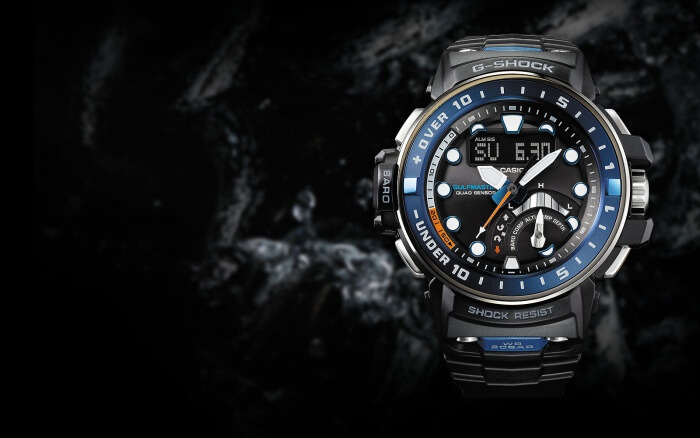 It is the first Gulfmaster model with sunrise/sunset data and a sapphire crystal. The watch has a resin case with a carbon fiber reinforcement. The back cover and band are made of soft urethane for maximum comfort on the wrist. The index, hour, and minute hands have a phosphorescent treatment for visibility in the dark. 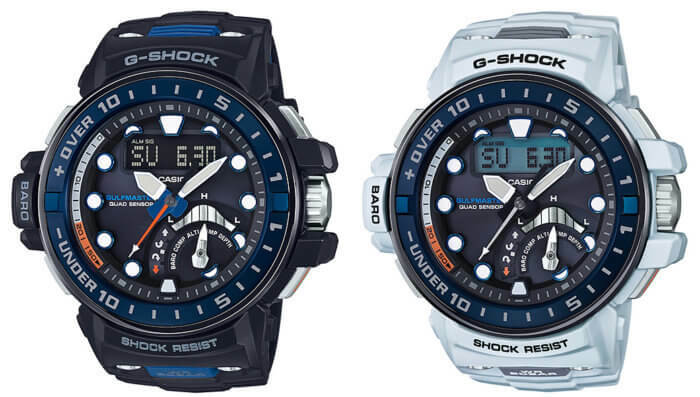 The Gulfmaster GWN-Q1000 exterior design is similar to the GWN-1000 with some unique changes. The LCD subdisplay is now on the upper half of the face and the tide graph and barometer indicators are at the 5 o’clock position and also include a sensor mode indicator. The side buttons look more like the Frogman rather than the circular buttons of the GWN-1000. 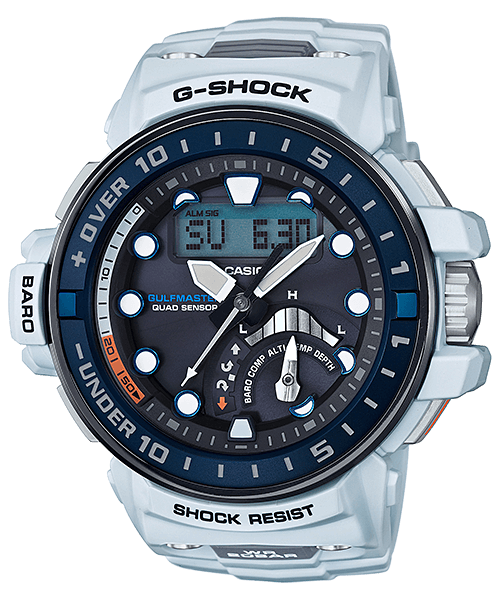 Like the GWN-1000 it has numbers on the bezel to display changes in altitude and atmospheric pressure. 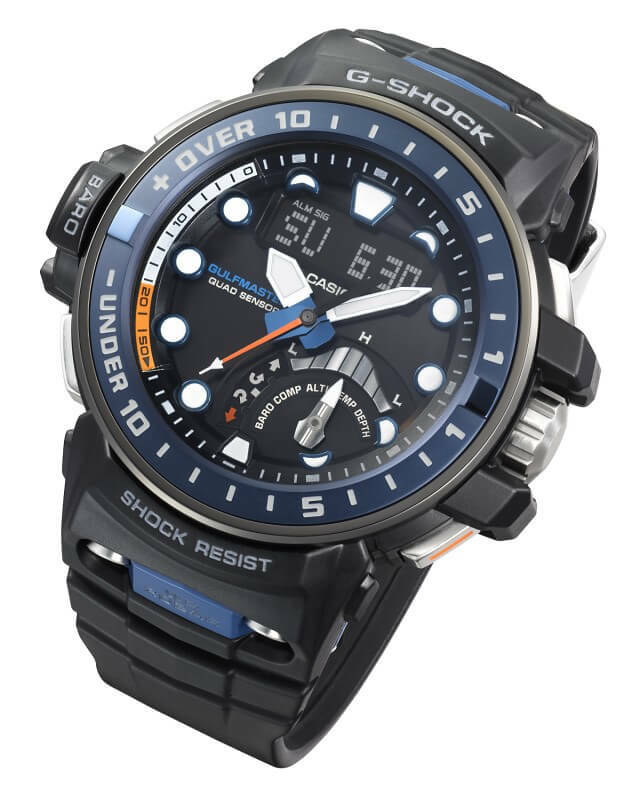 Other key features include shock resistance, 200-meter water resistance, Tough Solar power system, Multi-Band 6 radio wave time-syncing, world time (48 cities + UTC), 1/100 second stopwatch (24 hours), countdown timer (60 minutes), 5 daily alarms, hourly time signal, manual sensor memory function with time stamp function, and full auto double LED light with afterglow (1.5 or 3 seconds). The GWN-Q1000 measures 48.0 × 57.3 × 17.0 mm and weighs 113 grams. Black resin with blue bezel. White resin with blue bezel. I’m SO excited for this watch – please post an update when you know the release date:) Exciting! Why don’t they include vibration alarms on these watches? If it’s designed for offshore you are commonly sleeping in close proximity to others and on a watch schedule where waking up everyone or not hearing it at all due to background noise/earplugs are definite risks. I would buy this thing in a second if it had a vibe alarm. I love the sensors but if I can’t wake up to stand my watch they aren’t doing me any good. The watch I have been waiting for: Just like the SeaPathFinder 40. Baro, compass, tide and yacht timer plus solar powered and radio controlled accuracy. Now only a Titanium version. Hefty price tag though! I Just have to explain to my wife why I’m not wearing my Tissot sailing Touch anymore. I have been researching this watch all over the internet and I m close to buy it. I was, that is. This watch is ment to be worn at sea and travel the oceans. But there is an issue. It is a wave ceptor only. How can it keep it’s accuracy at sea far away from any atomic watch signal? At the very least I’d want a bluetooth connection to a smartphone that receives signals from GPS satellites and then use it to reset the watch. At $850 I’d expect GPS and/or bluetooth connection as well. You can wait and see if an updated Gulfmaster is released but there’s no guarantee that the next one will have GPS or Bluetooth. The quartz movement is very accurate to begin with so it’s not like the watch is going to become grossly inaccurate all the time. If GPS or Bluetooth is the highest priority then there are a lot of other G-Shock models to choose from. The closest model to the Gulfmaster with GPS right now would be the GPR-B1000 Rangeman. It can sync the time automatically with GPS and has a Triple Sensor (altimeter-barometer, compass, thermometer), but it is a digital model. I have a GWN Q1000 and have recently headed out to the middle east and outside of the range of the EU atomic clock. As we speak the last time the watch was sync’d was the 9th of October and so far it is still accurate to the second when I reference the watch to the timeis website. If this continues then it would suggest the quartz mechanism is as accurate as the best VHP quartz movements. The GWN Q model seems to have fallen from grace and I bought mine heavily discounted from Casio in the UK it is working very well so far and is an excellent product. As of today (November 7th) the watch is circa 0.5 seconds slow verse reference to Timeis website time. That is almost 1 month and suggests the movement is as good as any quartz movement on sale currently. 2 months without sync and the watch is now not quite 1 second fast. Taking the fact that the second doesn’t quite move ahead in step with the reference time. I think perhaps the accuracy of the quartz movement is possibly because of the fact this model was manufactured in the Japanese factory.